Last month, March 2014, marked the 20th anniversary of the release of the landmark 1994 Aphex Twin album Selected Ambient Works Volume II. I wrote a book, also out last month, about that album, as part of the 33 1/3 series. A main thesis of my book is that the Aphex Twin album’s extensive cultural afterlife has significantly shaped our understanding of its music, has changed the way it sounds, how it is appreciated. Much of that post-release change is the result, I argue, of the role played by fans of the music. This process has taken time, but it began almost immediately upon the release of the album, when a member of an email mailing list about electronic music took it upon himself to give names to the tracks on Selected Ambient Works Volume II. Those tracks on the record are, with one exception, essentially title-less. That is, they have no “word names” but are instead associated with cryptic photographs. The responsible fan on the mailing list, whom I tracked down and interviewed for the book, recognized the images in the photos and assigned names to each of the tracks based on those photos. Those fan-determined track names stuck, and in fact are to this day readily disseminated by such systems as Gracenote, which populates media services with record-album track metadata. And now, just a month after the Selected Ambient Works Volume II anniversary, again Aphex Twin fans have not only played a significant role in an album by Richard D. James, the British electronic musician behind the Aphex Twin mask — they have quite literally taken an unreleased album and made it commercially available for the first time. And the album in question dates from the same year as Selected Ambient Works Volume II: 1994. The story — thus far — goes as follows: The website factmag.com reported on April 8 the existence on Discogs.com, a popular crowd-sourced music database and emporium, of a copy of an album from 1994 by Caustic Window, one of many monikers assumed by Richard D. James. The album’s seller was asking for $13,500 (U.S.). What made the record special is that it had never been released. What was for sale was, in fact, a test pressing. 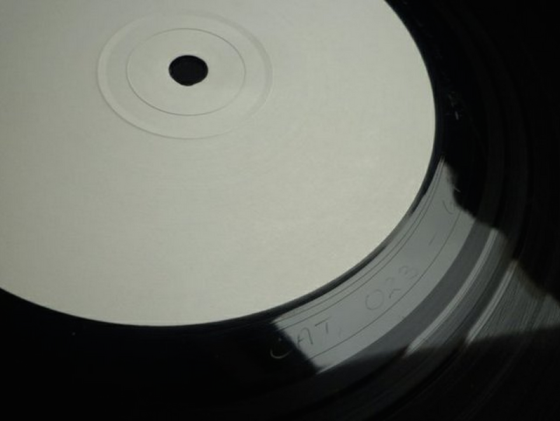 There may have been some initial doubt about the record’s existence since just days earlier, as part of an April Fool’s joke, the same magazine, factmag.com, told the story of a previously unheard Aphex Twin song, “Avril 1st.” The title of the track was a play on “Avril 14th,” the prominently sampled (it’s part of “Blame Game,” off Kanye West’s 2010 album My Beautiful Dark Twisted Fantasy) and licensed (Sofia Coppola included it in her 2006 film Marie Antoinette, and it was in the trailer for Spike Jonze’s 2013 film Her) song off Aphex Twin’s 2001 album Drukqs. In short order, members of Joyrex’s WATMM forum teamed up to support collectively purchasing the album, and Joyrex managed to clear the plan with both Richard D. James and his partner in the label Rephlex, Grant Wilson-Claridge. Within hours of the album going on sale at Kickstarter, the project surpassed its stated goal of $9,300; as of this writing, there are still 29 days to go in the Kickstarter campaign, and it is already at almost double its financial threshold for success. Below, Joyrex talks at length about the process that led to the album’s release, his negotiations with Aphex Twin and Wilson-Claridge, the origin of his WATMM forum, and much more. Much about the WATMM-forum situation has fascinating parallels with the music mailing list responsible for the naming of the tracks on Selected Ambient Works Volume II. That list was named [email protected], part of the hyperreal.org site. Like WATMM, [email protected] originated as something intended to only cover Aphex Twin’s music, but expanded its scope. Joyrex notes that he used a vote on WATMM to decide whether to pursue the project, much as back in the early 1990s members of the [email protected] list — in which I was an occasional participant — voted on such subjects as whether or not to jettison Aphex Twin discussion to a separate list, so packed was [email protected] with material about that single artist (the motion failed). The individual from the [email protected] list who named the Selected Ambient Works Volume II tracks, Greg Eden, went on to work for Warp Records for a full decade, and a member of the WATMM discussion form, named Wisp, has himself been signed to Aphex Twin’s own label, Rephlex (there’s more detail on both those scenarios in my book). Back in May 1994, the label Warp, on which Richard D. James releases the music he records as Aphex Twin, released the album Artificial Intelligence II, and as a sign of acknowledgement of the [email protected] list, segments of messages from [email protected] email discussion appeared as graphic elements on the album; the record included music by Polygon Window, another Aphex Twin pseudonym. This time around, the WATMM discussion didn’t merely provide window dressing for a record containing Richard D. James music — it is fully responsible for the album’s release. Given how often online forums are maligned as places where music is traded illegally, it’s wonderful to see just such a forum function like a proper record label. The role of Kickstarter in commercial popular culture is routinely debated. Back when the Veronica Mars movie was funded through Kickstarter, there was much naysaying — mistakenly, I thought — that suggested that Kickstarter is more meaningful somehow when associated with “independent” projects. I think that distinction is a false one, especially when for all intents and purposes, the original Star Wars movies can be considered independent films. What’s unique about a service like Kickstarter is the bond it forges between the producers of culture and the fans of that culture — forget the so-called “emotional” bond, which can be an excuse for all too much blather about the role of “meaning” in “branding,” but a functional and practical bond. While the Kickstarter service itself is new, it harks back to an age-old — and until recently, outdated and seemingly outmoded — practice, like when Samuel Johnson in the 1700s signed up subscribers for his dictionary while it was still a work-in-progress. The unique nature of that bond goes far beyond the act of purchase, far beyond the matter of financial support. It is part of the story of how Selected Ambient Works Volume II was shaped by its reception, by its embrace by passionate fans and by other artists, including choreographers, comedians, filmmakers, and composers — not just at the time of its release, but in the succeeding decades. In any case, I am highly appreciative of Joyrex having taken the time to answer my questions in detail. Below is a lightly edited transcript of that interview. Marc Weidenbaum: Can you talk a bit about your thinking process — from being aware of this item’s availability, to getting the WATMM folks together to fund this? It’s a stroke of genius, I’d say. Did you immediately just get on the boards and propose it, or did it come to you after some time? Joyrex: I found out about it being for sale on Discogs.com like everyone else – on WATMM! I reached out to the seller and asked a few questions to satisfy my own curiosity, and around the same time one of the forum members joking suggested we crowdfund this and buy it so everyone gets a copy (despite that being illegal), and I thought, “Why the hell not?” So I posted a thread and poll asking if the community was willing to pay up to $25.00 for a digital copy of it, and it grew from there — I sent Grant [Wilson-Claridge, Aphex Twin’s partner in the Rephlex label] an email, proposed the idea, and he and I hashed things out. Weidenbaum: Can you characterize or describe the music, for folks who haven’t heard it? Joyrex: I personally haven’t heard the tracks (not knowingly at least — I’ve heard other unreleased Aphex, but that’s another story for another day), but the interview I did with Mike Paradinas (aka Âµ-Ziq) back in 2001 for my Aphex Twin fansite, joyrex.com (now defunct), that people have reposted on WATMM goes into detail about what each track sounds like – I’m really excited to finally be able to hear them after all this time. Weidenbaum: I’ve read through the WATMM discussion, but I’d rather have your direct take on this: Did the collective effort come together fairly smoothly, or was there some disagreement in the ranks that had to be managed? Joyrex: This has gone amazingly smooth (and quick) – Grant (and by extension, Richard) have been very accomodating and very helpful in this process. I’m pretty much a one-man band when it comes to running the site (other than the moderators, who keep the rabble to a minimum on the forum), so there was no “disagreement in the ranks,” as it were. Of course, many members of the community have provided brilliant suggestions and have reached out to me with offers of help with the project. Weidenbaum: For clarification’s sake, will there be a generally available (“unlimited edition”) digital-only copy, in addition to the 500 physical copies that have been mentioned in news reports and in the forum? Or is the idea that once the 500 copies are done with, the whole thing is done with? Weidenbaum: It’s interesting to me that this Caustic Window endeavor happened so quickly after the “Avril 1st”joke circulated on April Fool’s Day, since the “Avril 1st”joke involved there having been some long lost MP3 player packed with additional, unheard Aphex Twin tracks. Do you think there is a vast backlog of Aphex Twin music out there, somewhere, waiting to be heard? Joyrex: Well the timing is pure coincodence — I was only vaguely aware of the “Avril 1st” joke, but that’s kind of a tradition with electronic music and April Fool’s. I (in)famously pulled a Boards of Canada”“related prank some years ago, and it really upset the community. I have since realized it’s not a good thing to upset electronic music fans hungry for more music! Richard has hundreds of top-quality unreleased tracks — very little of what he produces sees commercial release, and you may have heard he makes music mostly for himself. It’s entirely true. He’s only commercially released music because of the obvious financial benefits (and it gives him time and freedom to make more music). Weidenbaum: For context, please fill people in a bit on the origins of WATMM — when it was founded, who was responsible? Joyrex: Back in 1999, I had gotten a job as a graphic designer, and at time time, I saw and knew that the Internet was going to take off in a big way, and the Internet was a logical extension of my love for graphic design. I taught myself how to write HTML, and what better way to teach yourself something than to apply it to something you love? At the time, I studied the existing Aphex Twin fansites, made note of what they did right, and more importantly, noted what they lacked – with that, joyrex.com was born as an Aphex Twin fansite, and it took off. It took off so much in fact that in early 2000, the site was absorbed by a startup called MusicFans, and they were paying me to run my fansite! Sadly, as with many startups of that era, they folded, and unfortunately part of the agreement was purchasing the rights to the domain, which I lost and was it sold via a court-ordered bankruptcy. I wanted to continue on, but more importanly, I wanted to expand beyond just Aphex Twin (members of my community got me into Boards of Canada, Autechre, and Squarepusher), so the idea of WATMM was born and launched in mid-2001, with hardly a disruption between joyrex.com and watmm.com. Over the years I learned what worked and what did not in not only managing a website, but also cultivating an online community – one of the reasons I think I’m still doing this 15 years later and now with WATMM becoming one of the premiere online electronic music communities is my determination to make it a place you want to particpate in on whatever level you feel comfortable. Weidenbaum: And yourself — where are you from, and where do you live? Joyrex: I’ve lived in Texas now for the past 20 years, and prior to that I lived in Sacramento, California. I’m a programmer by trade these days, and in what little spare time I have, I manage WATMM. Weidenbaum: Have you learned anything else — are there any other details — about the individual who is selling this Caustic Window record, and how they came upon it? Joyrex: Everyone asks me about that! He’s just a normal guy, who happens to be close friends of Grant and Richard — close enough to have gotten a copy of this album, it seems. He was given it around the time it was pressed, probably in a very mundane “Here, this is Richard’s latest Caustic Window stuff we’re thinking about releasing” sort of way. Rephlex are very laid back like that. Weidenbaum: Had you participed in any of the Hyperreal.org discussion groups before getting WATMM going? Joyrex: No, I actually didn’t get into all that — I wasn’t technically literate enough for mailing lists, etc., back in those days. I recall from the old WARP AFX FAQ and Chris “Evil” Miller’s Aphex Start websites being my indoctrination to the wonderful world of Richard’s music. Weidenbaum: Is there any precedent within the WATMM community for this sort of record-label-like activity? Joyrex: Well, in 2004 we released a CD – a compliation of artists from the community (no big names) called We Are the Music Makers | Volume One. This Kickstarter has given me the idea that we could do a second compilation and actually make money off it this time! We have a huge community of talented musicians (some of which are signed to the very labels of the “Featured Artists” we devote forums to, like Wisp on Rephlex), so doing a Volume Two with possibly a vinyl version would be fantastic (plus it would give me a chance to stretch my graphic design muscles again after a too-long period of inactivity). Weidenbaum: This Caustic Window record dates from 1993 – 1994, an amazing period for Richard D. James, who had recently signed with Warp, released Selected Ambient Works Volume II, as well as Surfing on Sine Waves, among other things — do you have any insight, and thoughts personally, on what made that period such a breakthrough? Joyrex: I think Richard was hitting his stride. After the success of Analogue Bubblebath 1 and Digeridoo on R&S, all the music he’d been working on since 89-93 was finding an outlet, plus he was (and probably still is) a prolific artist, so the hundreds of tracks he was making had to come out somewhere! I think also the persona he crafted around his music lent itself to the mystique and meshed perfectly with the music, which was unlike anything anyone had ever heard before. View the Kickstarter for the Caustic Window / Aphex Twin album at kickstarter.com. View the for-sale listing that started it all at discogs.com (the above image accompanied the listing for the album). View the WATMM message board forum where the fan movement began at watmm.com. This article was edited on April 11, 2014, to correct the release date of the album Drukqs. It was 2001, not 1996. It was smart of RDJ to wait until after his divorce to sell his copy. I don’t know, and I’ve done some initial snooping around. If I find it I’ll post it here. Very interesting. Thanks for that.